My childhood was punctuated by a neon-yellow, quilted vinyl picnic basket. Nestled in the backseat of the car every family vacation, road trip, or beach day, it was all but the fifth member of the Ayer household. The picnic basket generally portended good things: getting some fresh air and stretching my legs; ceasing my father’s favorite Carnatic music tapes or crackly AM news updates; linking up with other road-trip kids while exploring gas-station candy aisles. But as the other children returned to their families and put in orders for their cheeseburgers and onion rings on these rest-stop breaks, our picnic basket also meant something else for me: a homemade, potato curry-filled sandwich. Wrapped in foil and stored in the empty plastic bread bag, still cold from being in the fridge the night before, this sandwich fueled our journeys great and small. It brought together a lot of my favorite things, including green pea-flecked, cumin-spiced potato curry, buttered slices of white bread, a sprinkle of grated cheddar cheese, and lots of chopped cilantro. 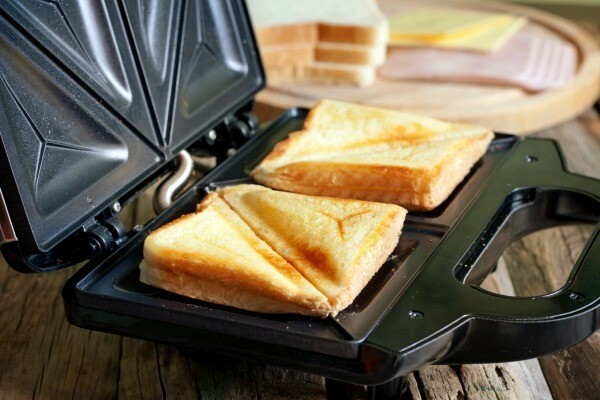 The whole thing was griddled in a handy Equity-brand sandwich maker, which sealed the sandwich shut, crisped up the edges, and portioned it into neat little triangles that were easy to transport. We’d eat the triangles dunked in tomato ketchup or cilantro chutney, alongside banana chips or an Indian snack mix of lentils, peanuts, and deep-fried rice-or chickpea-flour crispy bits, called “mixture,” and wash it all down with chocolate milk (also in the picnic basket). The sandwich was objectively tasty. I’d eat it again now, if I could. But, on second thought, maybe I wouldn’t. My relationship with that sandwich is infinitely complicated. Picturing the foil-packet-in-bread-bag scenario makes me feel a strange combination of nostalgia and discomfort. It bubbles up excitement and the prospect of adventure, but also reminds me of countless family tiffs and squabbles we had along the way. At what exit were we supposed to get off? Someone needed to use the bathroom, again? And, really, how were we not there yet? Most of all, thinking of the sandwich brings back feelings of disappointment and a little resentment: towards the unfortunate timing of the trip that prevented me from attending a friend’s pool party; towards the weird stalagmite museum we were visiting that day; towards the snacks that seemingly every other kid was eating, whether from a theme park or vending machine. Why couldn’t we be snacking on those things, too? Sure, the sandwich was more affordable than buying snacks on the road. And I guess it was healthier, too. Mostly, though, my mother made it to keep the peace in the family—an Indian-inflected, Western-ish finger food that the kids tolerated and my more-traditional father appreciated. But the lumpy, squashed, definitely-not-a-burger sandwich was a terrible consolation prize. It made me not want to eat at all (I still did, begrudgingly). I’m aware this makes me sounds extremely ungrateful. As I said, that sandwich was really very good, and my mother was very thoughtful to have brought enough along for the whole family. But in my defense, this sandwich was a fixture in my life from ages six to twelve, and at that point, an enormous cone of garlic fries seemed like a much better idea than something lovingly homemade and nutritious. The novelty of overpriced food from Disneyland always outweighed the sensible contents of our carefully packed, neon-yellow companion, even if the funnel cake, kettle corn, and giant lollipops ultimately didn't taste that good and likely would've made my stomach ache. Even outside of Disneyland, I craved all things sugary, crispy, crunchy, and not the sandwich as our family-trip meals. I wanted the crinkly-bagged snacks all the other kids were munching on in the back seat of their minivans between rest stops; the ice-cream cones that dripped down the backs of their hands and onto the beach towels they sprawled out on before dipping in the Pacific; the soda-pops they brought to picnics, which cheerfully fizzed away after being shaken haphazardly, annoying me even more about my own water or 100% juicebox. Here are the fourteen snacks I envied from afar and missed out on eating, all because of the potato-curry sandwich I couldn't rid my childhood of. To this day, I've tried most of these items only a small handful of times. I haven't eaten the sandwich in years. Old habits, I guess. Hot, crispy, tender, sugary, doughy. Steeped in oil. What’s not to love? Won’t indicate where from, but will slyly hint at the chihuahua spokesperson. Hot, crispy, tender, salty. Steeped in oil. Hot, crispy-crunchy-tender, salty, doughy. Not steeped in oil, but I’m sensing a theme. Fluffy, sugary, pretty to look at, fun to pull off by the fistful and let it dissolve on your tongue. Also makes aforementioned tongue very blue or hot pink, which is a distinct bonus. (With mint chip ice cream, of course.) I don’t think I even liked mint-chip ice cream as a kid, and I definitely prefer other flavors now, but it’s green and that instantly means fun. Salty, sweet, buttery, crunchy, in comically large souvenir bags. Blue raspberry or Coke-flavored were my favorite. Sugary, icy (you’re welcome), syrupy, can also turn tongue blue. Hot, cinnamon-y, sugary, doughy, steeped in oil. Arguably Disneyland’s very best snack: pineapple-flavored soft serve, sometimes sold atop fresh pineapple juice as a float. Refreshing; just magnificent. An apple is great, but its candied alter ego—surrounded by caramel and chocolate and nuts and pieces of Oreo cookies and marshmallows—is arguably better. Most of the time, I eyed individually wrapped squares of fudge at gas-station check-out counters. Can someone tell me—are they any good? One is never enough, but two makes your tooth enamel feel kind of funny. And we’re back to the crispy, doughy, sweet, oil-soaked hits. As adults, we have the option to eat whatever we want, whenever the mood strikes us. For me, this often means leftover farro salad for breakfast, cake for lunch, or chips and salsa for dinner (we’ll get to this another time). It means that when I travel or go on road trips, I can buy crackers and candy and fries and soft pretzels from the airport, train station, or rest stop 7-11. But I’m pretty sure my mother was onto something all those years. As it turns out, all I really want—what I truly crave as I’m going somewhere new or embarking on any kind of adventure—is that damn potato-curry sandwich. What did your family bring along on road trips? Tell us about the snacks you grew up eating in the comments! I am from Southern Louisiana and my parents traveled a great deal for church during my childhood. Your story was so familiar - breakfasts were hot toast with jam folded in half so they wouldn't leak (griddled toast, no toasters in our home), lunch was from a large cooler containing half-frozen bottles of water and a bowl of tuna salad and a jar of mayo. Mom always packed a loaf of bread and a bag of pretzel sticks (So dry. SO so dry!) and we'd pull over somewhere for a tuna salad picnic. To this day I can't stomach the taste of canned tuna, but I have surprisingly nostalgic memories of those trips, even though I hated them as a child. Thanks for the walk down memory lane, and the reminder that so many experiences are universal, independent of cultural backgrounds! Hi Lydia, thank you so much for sharing! Your childhood tuna salad picnics sound eerily familiar (swap out the tuna for some potatoes, and you've got our family van! ), and I definitely understand the feelings of nostalgia all wrapped up in it. I'm so glad this story resonated with you—a universal experience, indeed! Although I already have a sandwich press I went on the hunt for another with a design rather than just the grill marks and found Breville Deep Fill Sandwich Toaster on Google. Will try this recipe soon and let me know if anyone tries this toaster,I may just splurge and get it myself!! Cheers! Let me know if you try it out, Isabella! Thank you for this wonderful Hyphen American piece of writing. I like so many things about it: how it shows the colliding of cultures, the expression of love through food, the complexity of family, and includes a tempting recipe to top it off. bhb, thank you so much for your kind words! I hope you get to try out the sandwich—please let me know if you do! My mom would make homemade sausage McMuffins for road trips - I was always annoyed we had to have the “fake” breakfast sandwiches, and then my mom would point out that my grandma had been making egg and sausage sandwiches on English muffins longer than McDonald’s had - so we were eating the “real” sandwiches. Now of course, I make my own homemade McMuffins quite often on workdays, and if I have children, I fully intend to torture them with the sandwiches as well. Kileen, thanks so much for sharing! Those McMuffins sound delicious—I'm glad you're still enjoying them! I'm so sad to have missed this sandwich, Brinda. I envy the car rides of your youth! Don't worry, Hana, I'll start making this for lunch (to share! ), and your envy will soon turn to funnel-cake daydreams. Oh, the many times I've wanted to tell my parents, "No one else has to eat this!" Thank you for sharing, Brinda. Lovely essay. Oh, same here. And yet I always want to eat those things nowadays. Thanks for reading, E! Hello! im dying to know what sandwich maker you used for the pictures? Thank you! The Hamilton Beach 25430 gives a very similar pattern to the one in the photo. I realized the Hamilton Beach is like the one she linked to as the one she used, which is supposed to be the Equity brand. I agree, the one in the picture (obviously a contemporary photo) is darling (and not the same). Hi Crickett (and everyone else)! Thanks for reading and asking about the sandwich press! The one we used here is actually a handheld toastie iron from Mumbai, and I'm unfortunately not sure where to find one with the exact same pattern, but there are some similar options available online (like this one: https://www.amazon.com/Rome-Industries-1705-Sandwich-Cooker/dp/B000FNLXWG/ref=sr_1_1?s=home-garden&ie=UTF8&qid=1529372709&sr=1-1&keywords=sandwich+iron)! Hope this helps! Ah, I suspected it was a stovetop type. It is very sweet.